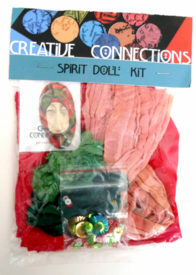 Spirit Doll Kits come in various sizes and combinations. 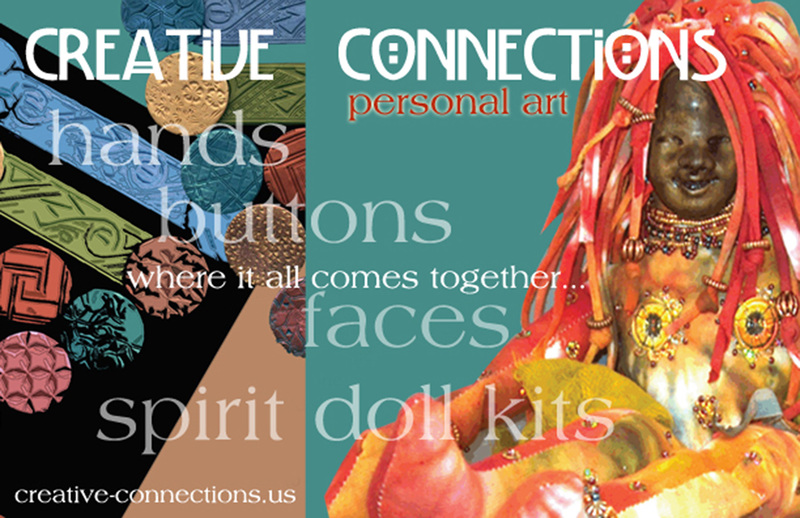 Each is just a starting point for your creative input! 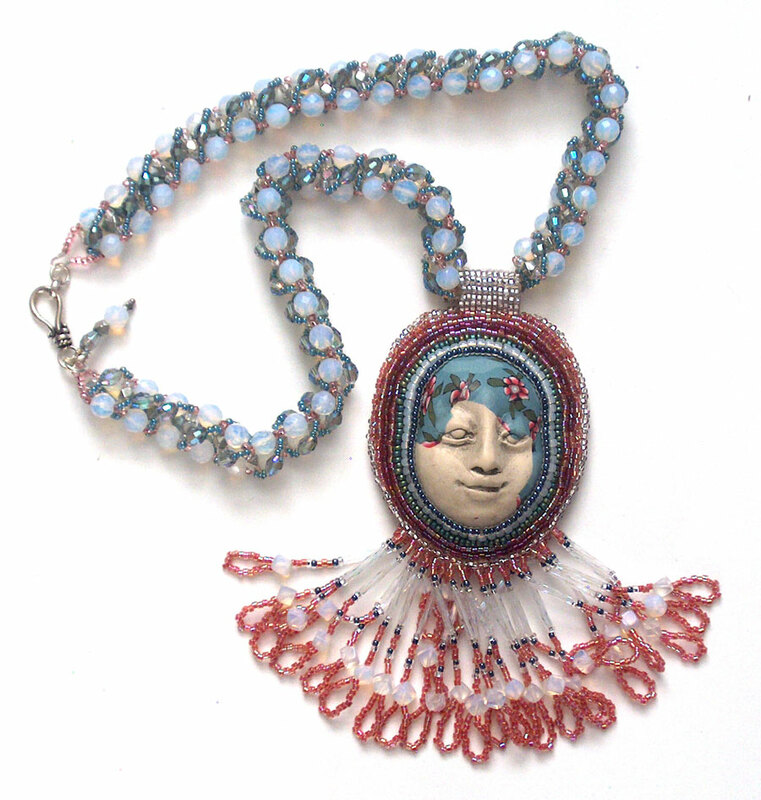 Take the soft, vibrantly hand-dyed cotton or silk fabrics, silk, cotton and rayon ribbons and lace, a clay face and bag of assorted detail beads, feathers, trims, and sequins as a starting point for your creativity and make your own totem, necklace focal point or talismanic pillow. 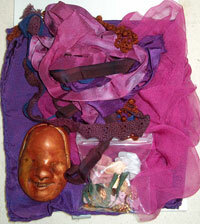 Or create a shadow box, a mini shrine, a reticule or a guardian bag for your tarot cards and other special items. 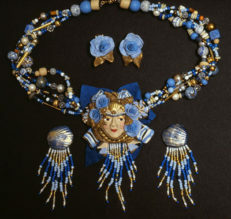 Personalize your design further by bringing out your own collected baubles, bells, or charms to embellish a one-of-a-kind piece that’s all your own. 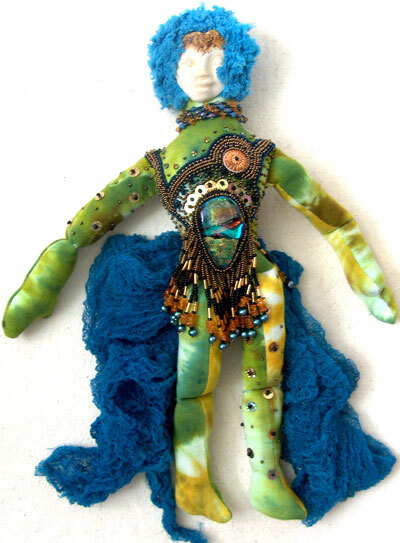 Add other fabrics from your “stash” if desired–velvet, lace or satin are always a nice touch! Throw in a few buttons and a tassel or two and you will have a truly awesome piece for display, treasuring, or gifting to someone you really like. The doll bodies and 100% cotton jersey fabric , silk handkerchiefs with hand rolled hems and the ribbons and lace bits have been dyed using Procion MX series Fiber Reactive coldwater dyes, and thoroughly rinsed and washed using Retayne and Synthropol for dye permanence and no shrinkage or color bleeding. Each cotton jersey fabric piece contained in some kits is a GENEROUS “fat quarter” or approximately 20 inches by 22 inches. 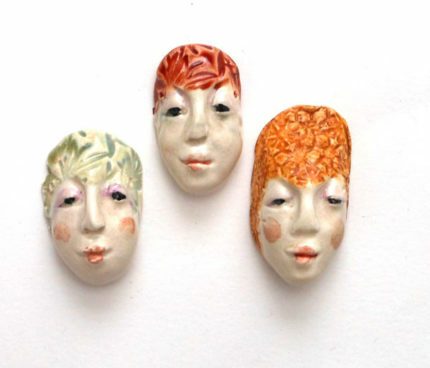 Faces are available in polymer clay and ceramic in a wide range of sizes and finishes. I create an original face in polymer clay, then make a silicon mold and use it to create a multitude of unique faces using the mold as a starting point. Polymer clay faces are finished in one or more of a wide range of styles, and can be affixed to the cloth in several ways including PVA glues (white glues such as Aleene’s Craft glues or Sobo) or by hand-drilling small holes for sewing with a pin vise or hand held drill bit. 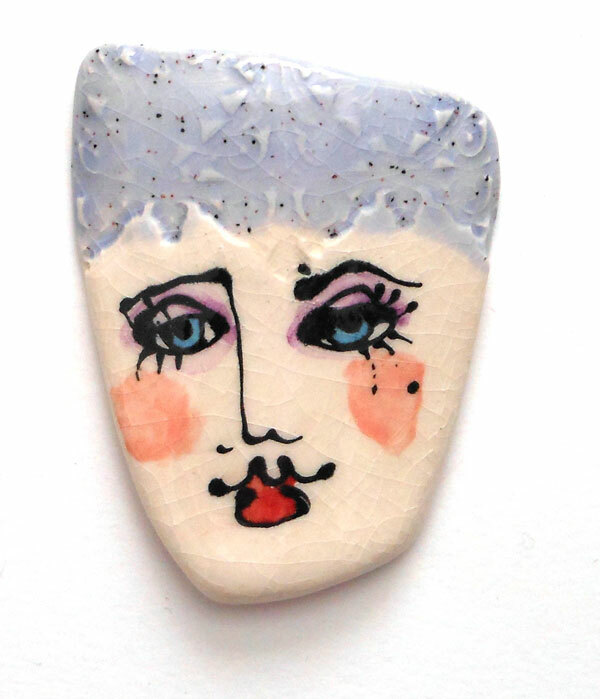 Polymer clay is relatively soft, and may crack if you just try to push a hole through–but it drills VERY nicely with little effort. You can also glue the faces to ultrasuede or leather using superglues (cyanoacrylates) and then use small decorations and seed beads around the face as a central focal piece. 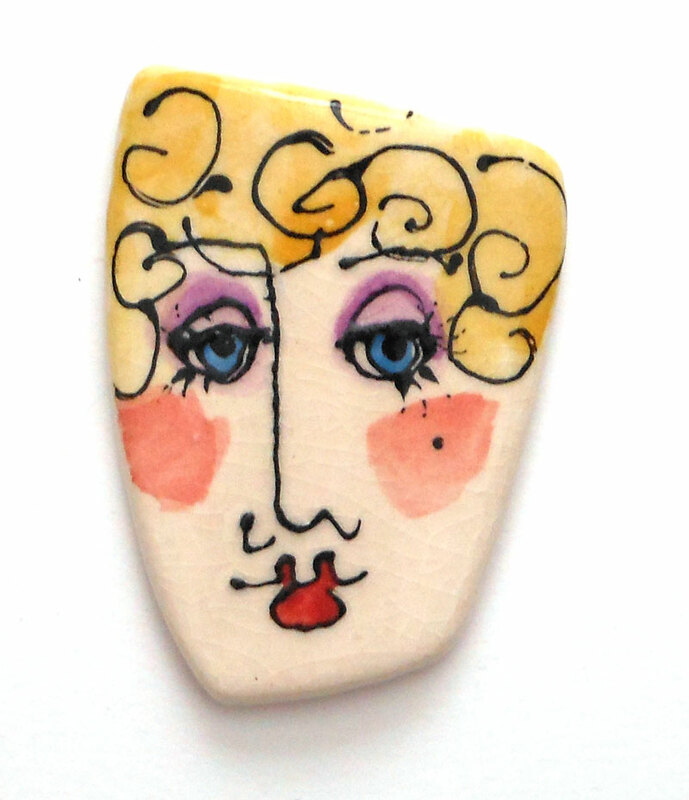 Faces can be re-baked using your own raw clay to embellish them further. 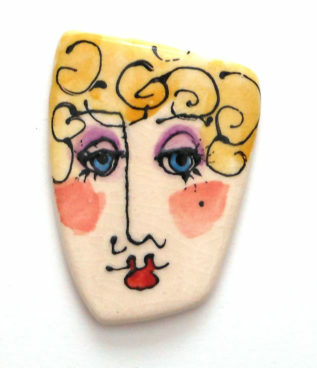 Ceramic faces are glazed with low fire glazes, with raku finishes, or with hand painted under glaze details and a clear glaze finish. Some versions are available with a stringing hole pierced from side to side on the top for sewing to doll bodies or for stringing into bead necklaces. 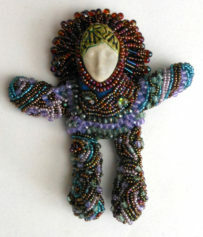 The detail bead or sequin packet starts you out, and then you can add your own collected bits and pieces. 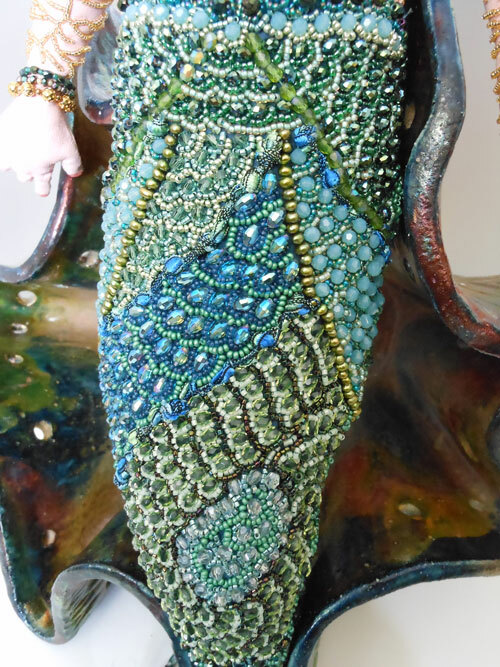 Embellish any project freely with embroidery, fabric paints, and whatever your design requires for its beautification and personal appeal. 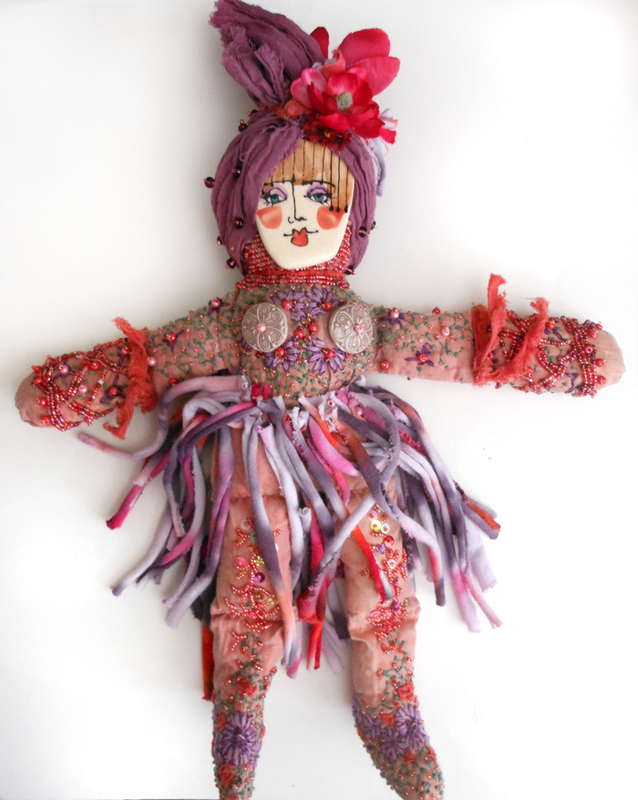 Be wild and outrageous, or sweet and demure–it is totally up to YOU! Spirit Doll kits are perfect for someone who already has many projects but would like a small intimate canvas for trying something new in the way of techniques or product. You can incorporate many established skills as well as collected artifacts and bits and pieces of leftover trims and supplies. 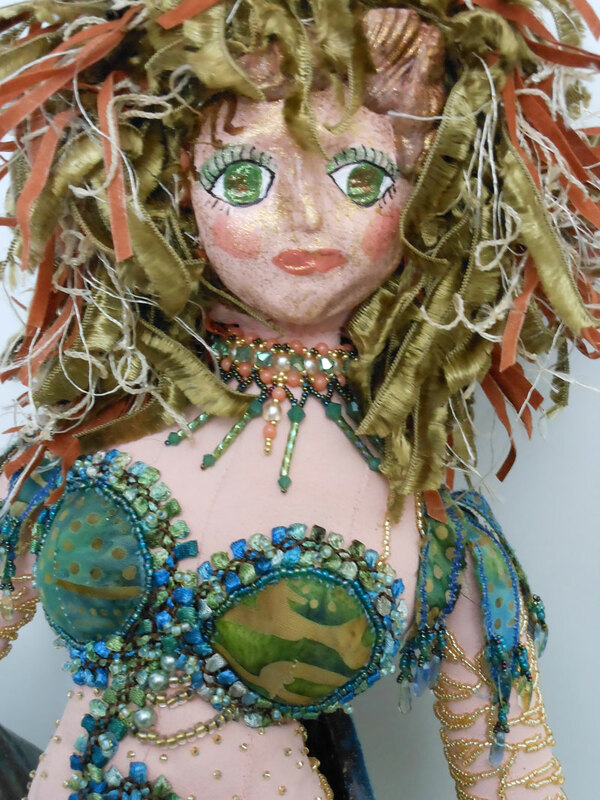 Spirit Dolls are fun to make with a group or a friend and present opportunities for sharing skills with new artists (mother/daughter, grandma/grandchild, sisters, friends, scouts and groups of all ages) and for expressing inner dialogues through art (art therapy). 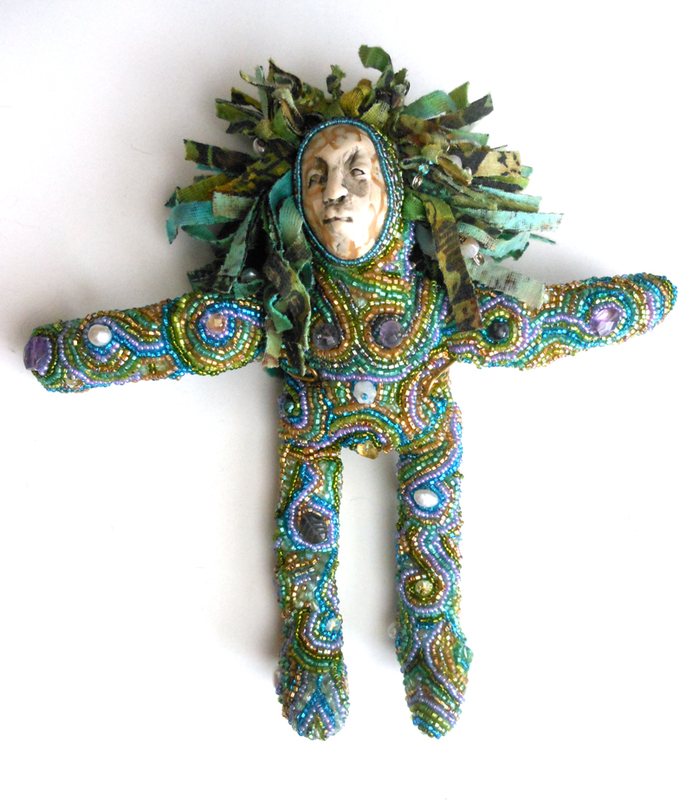 Spirit Dolls are not gender-exclusive, and can also be enjoyed by males who wish to express their creativity. 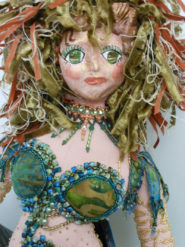 Each person chooses what they wish to express in an individual doll, and are not limited to “pretty” or “nice” applications although those are valid option as well. Spirit Dolls allow all levels of craftsmanship to have a fulfilling outcome to their project and are opportunities to become more aware of what is inside the maker’s thought processes and emotions through artistic creative expression involving the small, nonthreatening Spirit Doll as a canvas. 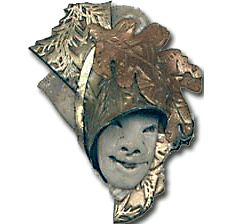 It can become a vehicle for communication with various parts of one’s deeper self. 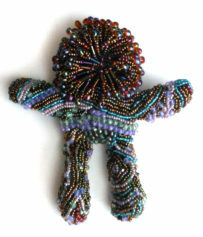 It can also be a simple opportunity for few hours of fun! However the creative spirit is expressed in a Spirit Doll, it is just right and fulfilling of the artist’s vision for that particular doll—and this freeing concept can translate to other areas of life as well. Make a simple round or square pillow using the cloth and stuff with Fiberfill Polyester or cotton stuffing (or use dried lavender flowers!) 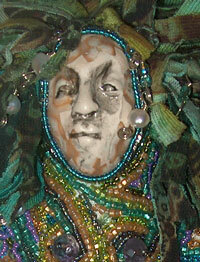 Attach face in the center, and add beads, fringe, ribbons, and other decorative accents. 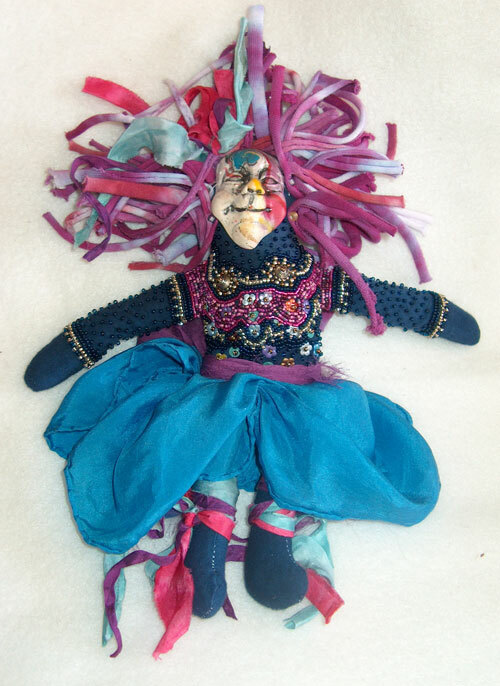 Use a pre-made cotton doll body and attach the face, dress the doll in the fabric and accent with added fiber hair if desired or use the ribbons and beads. 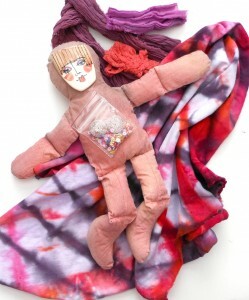 Make a doll body using the cotton fabric and a simple pattern. 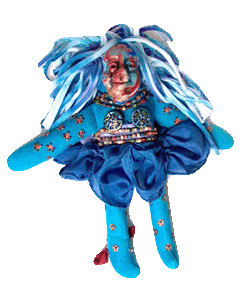 Rounded five pointed star shapes make very good doll forms with one point for the head and the others becoming arms and legs. You can draw a simple “Gingerbread Person” type outline or other shape on paper to use as your pattern–or use the pattern included. 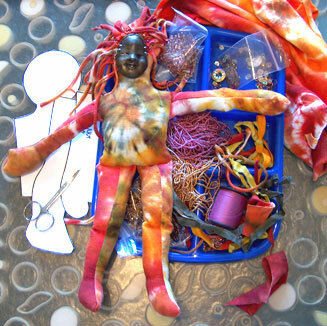 Sew, turn and stuff the doll, then attach the face and add hair and decorative details. Create a purse or drawstring reticule with the canvas bag as a base and the cotton jersey as a lining-or the other way around! 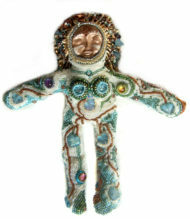 Premade doll bodies are available in my kits or can be purchased in craft stores. 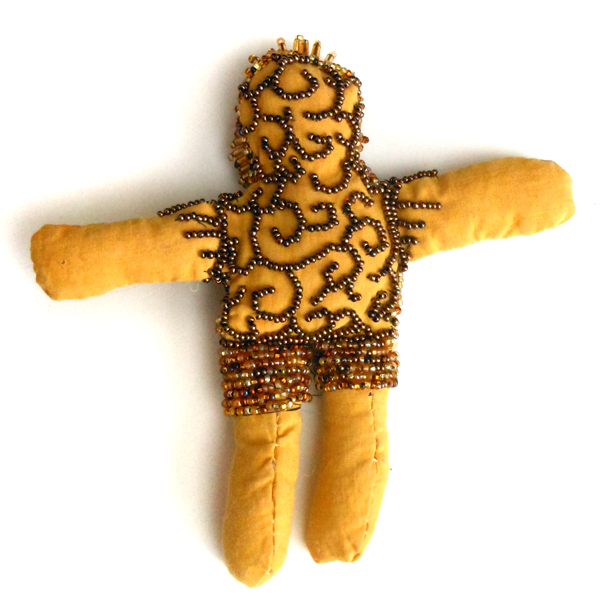 I have also drafted a very simple pattern that can be downloaded, printed and used for personal use. 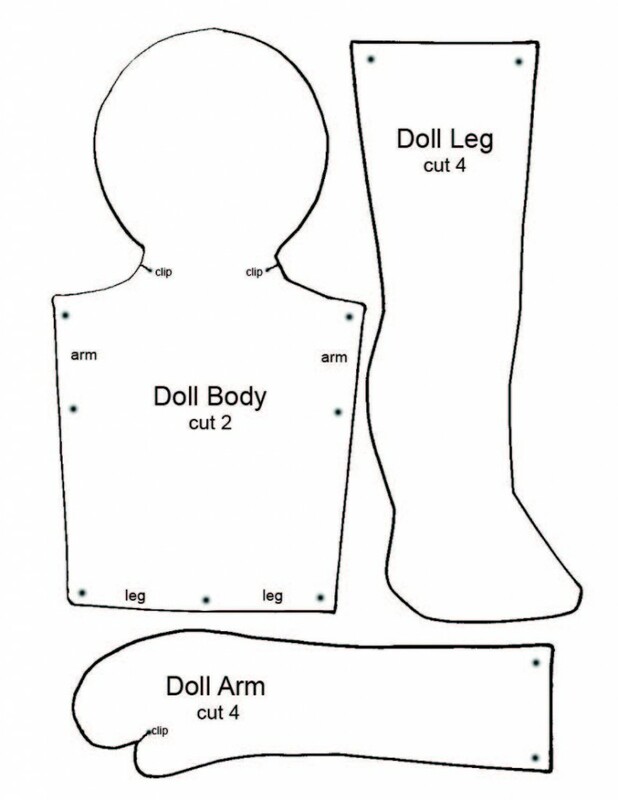 Print it out at different sizes to make dolls just the size you want. Have fun with it, but please don’t sell it to others as your own. 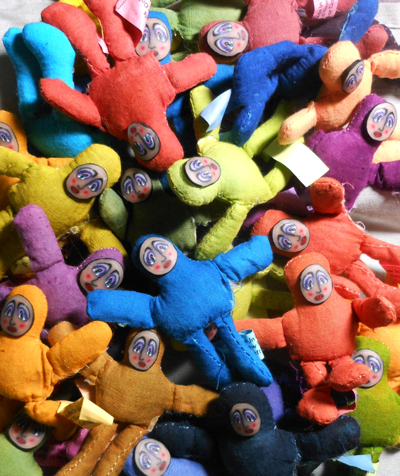 If you want to sell the dolls you make, then please do! 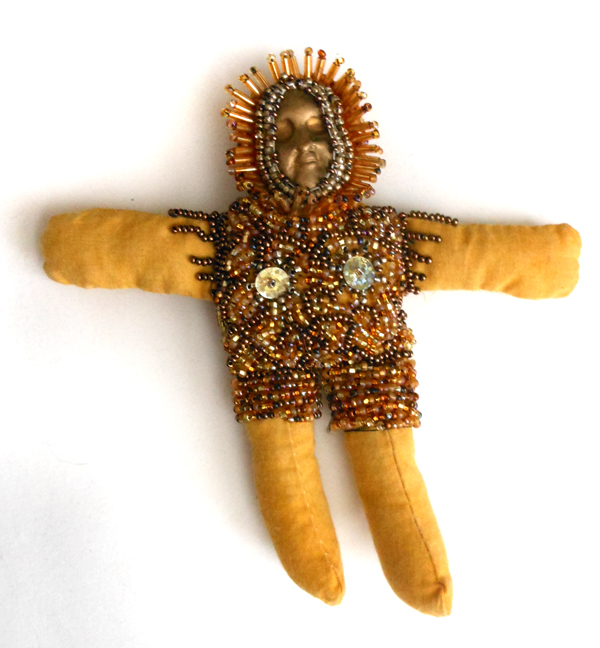 Click here to download these simple instructions for using the Spirit Doll pattern. Fold the fabric in half and lay the pattern out onto it, making sure there is enough to cut two body pieces plus four arm pieces and four leg pieces. Do not add more seam allowance as it is already built into the pattern. Use a ¼ inch seam allowance on all seams. With right sides together, sew around the leg and arm pair and leave the tops of each open for stuffing. 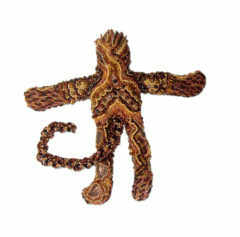 Clip the hand as shown, turn and stuff each arm and leg, then sew across the knee and elbow areas. 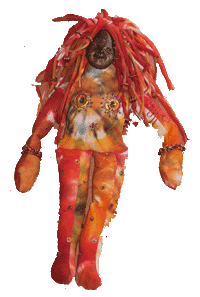 Place the tops of the legs at the bottom of one body piece on the right side of the fabric at the marks shown, with the feet up by the head, and stitch across the bottom to hold in place. Place the arms on the right side of the same body piece at the shoulders, with the arms going inside and sew to hold in place as you did with the legs. 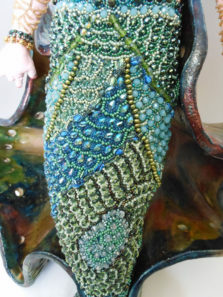 Then place the other body piece over all of it with right sides of the body sections together and the legs and arms inside in between the two and stitch along the bottom again. Sew around one side of the body, be careful not to catch the arms or legs in the seam. Point them out the open side as needed. It’s a bit crowded towards the end but it works. 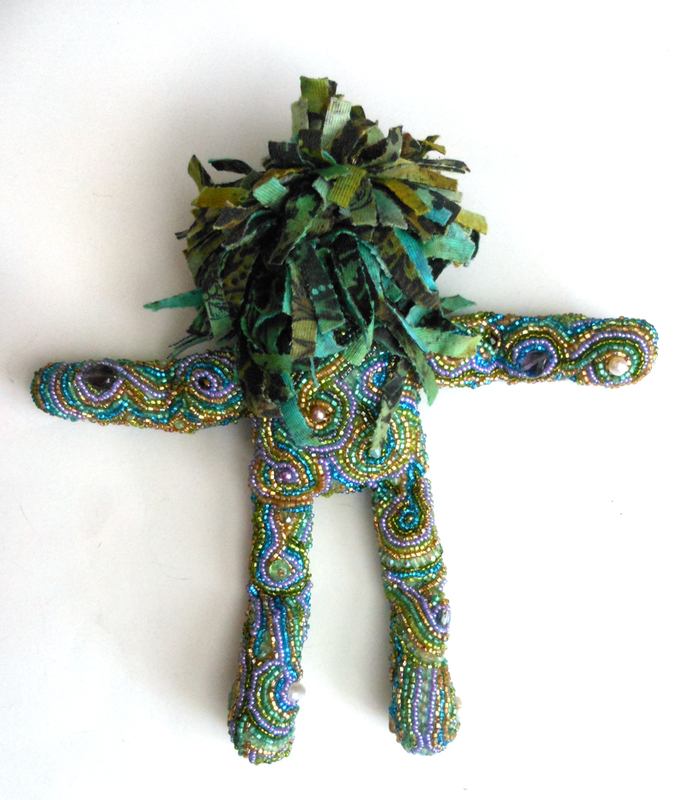 Sew the shoulder neck and head areas and continue down the second body side until you have sewn just slightly past the second arm, where the stuffed arms and legs are now sticking out. 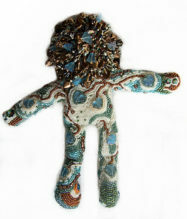 Clip the neck as shown and turn the doll body right side out, stuff, and hand sew the opening in the side closed after turning the raw edges in. Now you are ready to decorate! 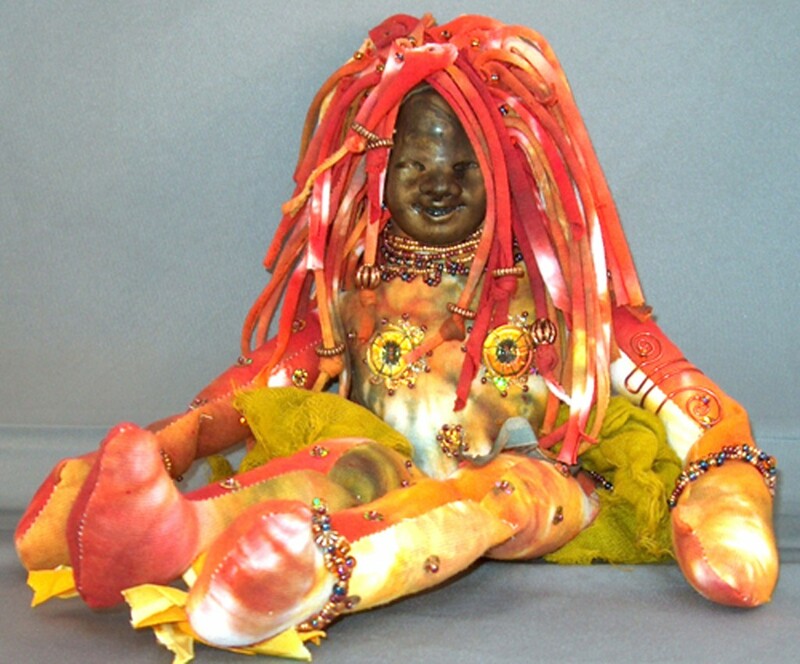 Kits feature color coordinated hand dyed components, some with a commercially made and hand dyed doll body and embellishments, some with a face (ceramic or polymer) and embellishments. 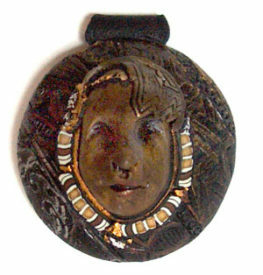 Faces are also sold separately. 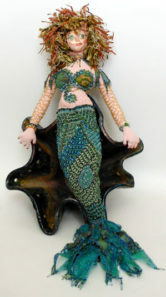 Contact us for more retail /wholesale information, to schedule a Spirit Doll class or shop at our Etsy store. 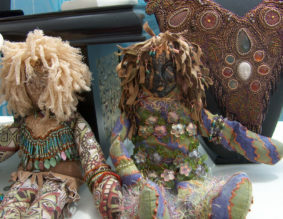 Here are some finished Spirit Dolls and wearable art pieces made by me and by Laura Sandoval. Also shown are some works in progress and some of the kits.